On March 29, 2012, the FDA initiated a “Class I” Naturalyte and GranuFlo recall after the agency discovered that the acid concentrates significantly increased the risk of patients suffering from heart attack, cardiac arrest, stroke, and death. The Class I recall is the most serious because it indicates there is a reasonable probability that patients exposed to the dialysis products will sustain significant and even potentially fatal injuries. The recall stemmed from post-marketing studies revealing dangerous Naturalyte & GranuFlo side effects and the failure of Fresenius Medical Care to disclose those medical risks to the FDA, patients, and certain healthcare providers. What are GranuFlo and NaturaLyte? GranuFlo and NaturaLyte are dry and liquid acid concentrates physicians use to treat patients with kidney failure. The acid concentrates are included in the solution patients receive while they are getting dialysis treatment. 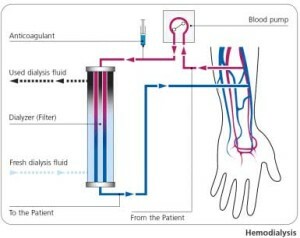 The dialysis solution is a mixture of GranuFlo, purified water, and sodium bicarbonate. Since bicarbonate prevents acid buildup in the body and helps the patient maintain proper pH balance, the prescription for the dialysis solution needs to be precise. Many physicians were unaware that the components of GranuFlo caused the bicarbonate levels to increase to an amount that put the patients at risk of suffering a dialysis injury. When patients have too much bicarbonate in their body, they are in danger of developing metabolic alkalosis and other serious medical problems, such as low potassium levels, low blood pressure, stroke, heart problems, and high concentration of carbon dioxide in the bloodstream. When GranuFlo and NaturaLyte entered the market, they were very popular products distributed to dialysis centers and hospitals throughout the country. Fresenius Medical Care not only used the products in their own dialysis clinics, but they also distributed them to medical facilities owned by other companies. Due to the high rate of patients suffering from cardiopulmonary arrest in dialysis treatment centers owned by Fresenius Medical Care, the company decided to conduct a case-control study that evaluated risk factors for patients receiving dialysis treatment. The study lasted from January 1, 2010 through December 31, 2010. During that time period, 941 patients suffered from cardiopulmonary arrest in 667 Fresenius-owned medical facilities. According to the study, patients were six times more likely to develop cardiopulmonary arrest if their pre-dialysis bicarbonate levels were high. On November 11, 2011, Fresenius distributed an internal memo to company executives and physicians who worked at Fresenius-owned dialysis clinics to inform them of the study’s findings. The internal memo stated that GranuFlo increased the risk of patients suffering from cardiac arrest. Physicians were advised to make proper adjustments to the bicarbonate levels included in the prescriptions for dialysis solution and to closely monitor patients so that any adverse health consequences could be treated immediately. The internal memo also emphasized that this was a dangerous issue that needed to be addressed urgently. In spite of Fresenius being aware of the dangers associated with GranuFlo, the company continued to promote and advertise the dialysis products as safe and effective. Naturalyte and Granuflo lawsuit actions filed against Fresenius Medical Care allege that other omissions and misrepresentations were made regarding the dialysis products. In March 2012, the FDA anonymously received a copy of the Fresenius internal memo regarding the medical risks GranuFlo posed to patients. On March 27, 2012, the FDA contacted Fresenius about the contents of the internal memo and side effects associated with GranuFlo. Two days later, Fresenius issued a public warning notification to the healthcare clinics owned by their competitors. Fresenius also started updating the labels on GranuFlo and NaturaLyte to inform patients and physicians about the increased risk of cardiopulmonary arrest and other medical problems associated with the products. On March 29, 2012, the Naturalyte & GranuFlo recall was officially implemented. After the public was informed about the GranuFlo recall and the potentially dangerous side effects, many patients who were seriously injured filed lawsuits against Fresenius. In March 2013, all current and future lawsuits filed in federal court over Granuflo side effects were centralized into multidistrict litigation (MDL). The Granuflo lawsuit MDL (MDL. 2428) is located in Massachusetts District Court, and was formed for the purpose of streamlining the pre-trial process, and hopefully bringing about quicker and more efficient resolutions to the cases. The manufacturer is also at the center of a federal investigation currently being conducted by the FDA. On June 14, 2012, the New York Times published a report stating the FDA will investigate if Fresenius violated federal law and regulations by failing to notify the agency and customers about the health risks linked to GranuFlo. Since Fresenius decided the safety hazards posed by GranuFlo were an urgent issue that needed to be addressed at clinics the company owned, all of the healthcare facilities that used the dialysis products should have been notified as well. By withholding this crucial information, and by delaying the Granuflo recall, Fresenius may have put thousands of patients at risk.